Moller International has announced that it has designed a hybrid flying car. 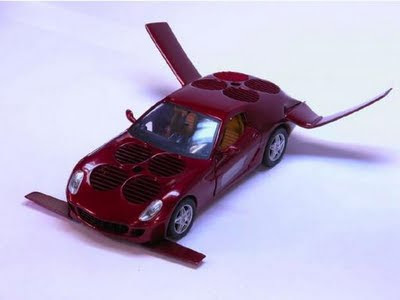 The two-seater autovolantor is fashioned in the shape of a Ferrari 599 GTB with wings and is claimed to be capable of lifting off vertically from a traffic jam and flying at up to 150 mph for a short distance (about 15 minutes). The autovolantor is designed to function on the road very much like a plug-in hybrid electric vehicle (PHEV) using one of its eight Rotapower engines to generate enough electrical power to drive for up to 40 miles. Moller International received a request to design this vehicle from a wealthy foreign businessman who was unable to commute from the city to his country home due to the overcrowded streets of Moscow. Moller conducted a preliminary analysis and found that a hybrid propulsion system powered by engines and electric motors together with its propriety eight-fan stabilized aircraft design could be blended to create the autovolantor. Scale model wind tunnel testing and further analysis predicted surprisingly good all around performance for the combined car-aircraft according to Moller. While the cost for developing a prototype was estimated at over US$5 million, Moller believes production versions of the autovolantor could be produced for under US$250,000 in modest volumes. The big question that remains is how the autovolantor could be used, and as we have discussed in Gizmag many times previously, regulations and licensing would certainly NOT permit its use within the foreseeable future. “It seems that it might be practical in some parts of the world, but in our view a roadable aircraft (versus a flying car) is still more practical for the greatest number of people,” said Dr. Paul Moller, founder and President of Moller International. “The autovolantor is technically possible, but flying it in US cities is not going to be politically acceptable until it has been deployed successfully in other roles and environments. Practical or not, it excites the imagination to think about being able to rise vertically out of a traffic jam and just go!” he concluded. The presentation on the autovolantor delivered to the 2008 SAE Wichita Aviation Technology Congress & Exhibition can be found in the image gallery for this article. It should also be noted that Moller International is now 25 years old, and was formed with the expressed purpose of creating VTOL vehicles - Moller had been previously successful in a number of ventures and has demonstrated the viabilility of his ideas, but has yet to produce a commercially available aircraft or flying car. Time will tell.